Click for direction to Lab - Get to UTD NSERL or RL building from Synergy Park Blvd. interactive campus map - NSERL is denoted as RL in the map, park in lot T, get a green visitor parking permit at the visitor center (VCB in the map), then park in any green or white slots. Welcome to Walter Hu's lab page. Our research has focused on design and fabrication of useful nanostructures, nano-devices/systems, and studying their applications in biosensing, nanomedicine, and nanoelectronics. 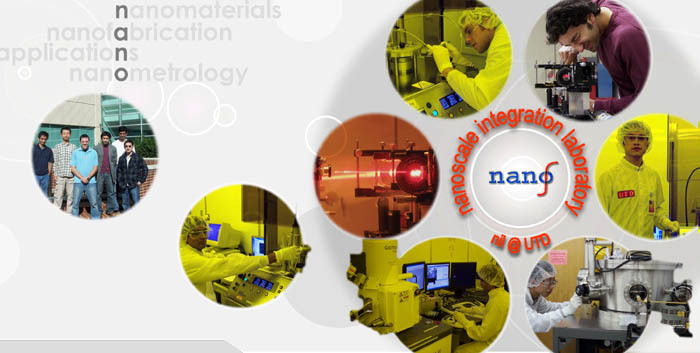 Our research involves integration of nanoscale elements of electronics, physics, chemistry, and biology.